By Adele Ahlberg Calhoun. InterVarsity Press, 2015. 352 pages. $22/paperback; $16.99/eBook. Calhoun is co‐minister, with her husband, of Redeemer Community Church in Needham, Mass., an interdenominational congregation that describes itself as evangelical and orthodox, holding “to the centrality of Jesus Christ as our only Lord and Savior.” Through long study and her own soulful searching, Pastor Calhoun has written a compendium of 75 Christian devotional practices that can lead worshipers into the mystery of the Trinity. These spiritual disciplines are imbued with the presence of the Triune God. The Father regards His creation with perfect love and acceptance; His grace has given the world the gift of his son Jesus, whose own healing love teaches us how to love. Jesus Christ is Master of our lives yet also our boon companion. And within our hearts, the Holy Spirit seeks us out, quickens our conscience, prompts us toward devotion, enlightens us in truth. Prepare to be in the presence of God. Imagine yourself coming to one of the persons of the Trinity: Father, Son or Holy Spirit.… Are you laying your head on the father’s shoulder? Are you sensing the wind of the Spirit that blows where it wills? Stay with God. Be open to listen. Allow God’s name to draw you in to the company of the holy Three in One. Inspired by Calhoun’s book, I recently went on two labyrinth walks. On my first walk, I was especially aware of the labyrinth as a symbol: how it imparts a sense of wholeness no matter how circuitous the path; how the “pilgrim” is always advancing toward the center even when the path, for a time, sends one away from it; how the journey inward always implies a return, renewed, to the world. 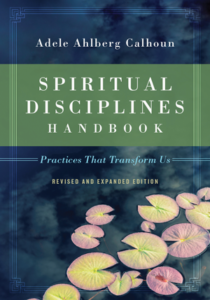 Each of the spiritual disciplines in the handbook is described with a brief, thoughtful essay reflecting on the desires that the practice can fulfill and tracing its lineage within the Christian tradition. Befitting the book’s designation as a “handbook,” every discipline is explained by means of a table divided into five sections: the desire motivating the discipline; a definition of the discipline; scripture verses that serve as the spiritual authority for the discipline; the practices entailed by the discipline; and the God‐given fruits that issue from the discipline. The tables are, indeed, a handy way to review and compare spiritual practices. Friends who are part of a spiritual formation group would find this book extremely helpful. For each discipline, Calhoun offers reflection questions—essentially queries—as well as exercises that, if engaged in sincerely, would encourage growth and discovery, individually and corporately. For those Friends who wish to explore any given spiritual practice more fully, Calhoun cites additional resources, such as books or websites. New to this edition of the book is a preface in which Calhoun recounts her apprenticeship to a Russian master of icon painting. This preface is a gem of personal reflection and leaves no doubt that Calhoun is invested in the spiritual disciplines that she so insightfully describes.